When you Install the Intel HD Graphics Driver, the Intel tray Icon and Hotkey program are installed by default. In some situations it is advantageous to remove these programs, for example, to prevent users accidentally rotating the screen. This can be done by manually by making registry changes to the system. There are two methods available, and old and a new method which will depend upon the age of the Intel HD Graphics driver you have installed. 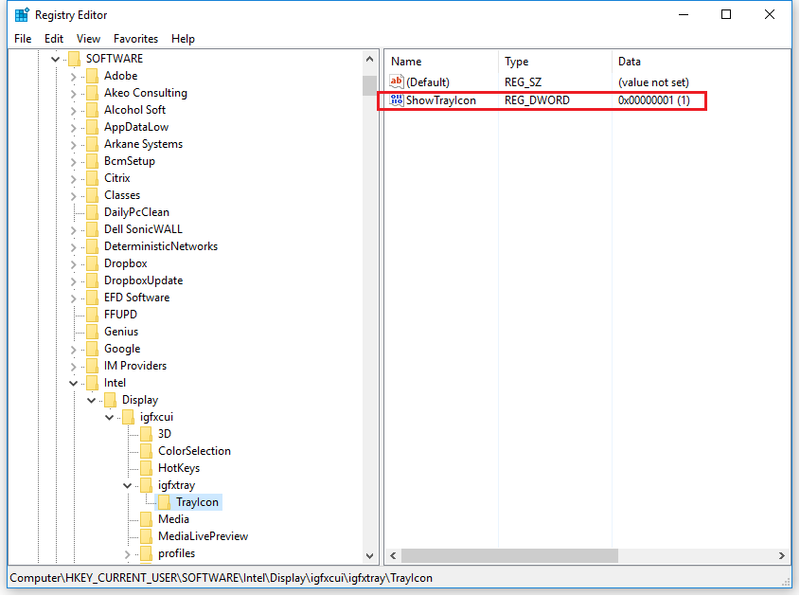 Check for a Registry entry under HKEY_CURRENT_USER\Software\Intel\Display\igfxcui\igfxtray\TrayIcon > ShowTrayIcon. If you have this key, you can set the value to 0 to prevent the tray icon from appearing. If you do not have this key, either create the TrayIcon key and then RegDWORD, or try the Old Method below. You will also need to disable the Hotkey functionality by setting HKEY_CURRENT_USER\Software\Intel\Display\igfxcui\HotKeys > Enable to 0. Note: As this is a per-user setting, as part of a managed deployment you may wish to deploy this registry change as a user group policy preference. This is the easiest way to push out this setting. 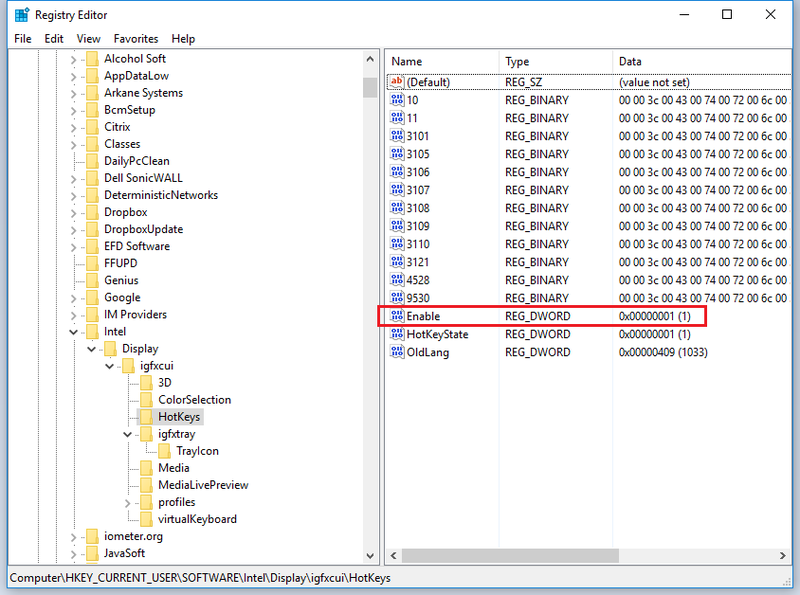 Check the for the presence of the key IgfxTray under HKEY_LOCAL_MACHINE\SOFTWARE\Microsoft\Windows\CurrentVersion\Run. If you have this key and the above method does not work, then it is likely that you have an older Intel display driver. If you have an older driver, you will need to remove the three keys below to prevent the tray icon from appearing. Once removed, there is no easy way to restore the tray icon other than restoring the registry entries from another machine, or reinstalling the driver. Manual removal is not convenient when rolling out large numbers of PCs. Please use the attached package for removal as part of a deployment or rollout. The registry file to remove the required registry entries (for example, you can use regedit /s remove_intel_igfx_tray.reg as part of a script). An alternative script for removal which relies upon the registry file. Note: ​The deployment task must be run with Administrative rights. The package includes registry entries for both the new and old method. The old method needs to be run once per machine as it is a machine setting. The new method needs to be run per user, as it is a user registry setting. Desktop, Laptop and Tablet products which include Intel HD Graphics.